Cloth-backed boards with original decorated cover laid down. A little damp spotting and browning to paper, thumbing to some pages but overall very sound. ; Nikolay Yakovlevich Agnivtsev (1888-1932) was a poet, dramatist and notably a children's author. He attended Petersburg University (but did not graduate). Agnivtsev contributed to "Satirikon" and various other journals. In 1917, he took part in "Bi-Ba-Bo" cabaret and wrote much of its repertoire. 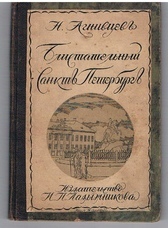 In 1921, in Berlin, he published his "St. Petersburg" verse collection. 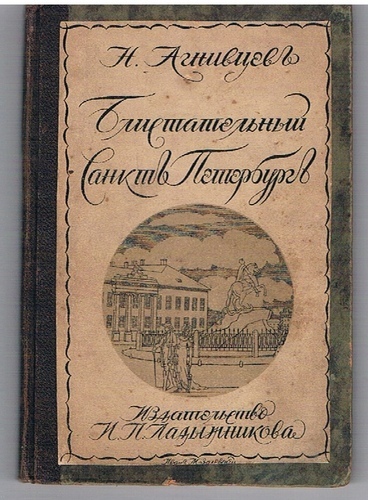 This present work is a new edition entitled "Blistatelnyi Sankt'-Peterburg'." [Brilliant St. Petersburg].